The 2009 season marked a breakthrough for the San Francisco Giants. That year, 22-year-old third baseman Pablo Sandoval celebrated his first full season in the big leagues by hitting .330 with 25 homers and finishing seventh in MVP voting. And on September 11, 22-year-old catcher Buster Posey made his major league debut, setting the stage for his development into baseball’s best catcher and for the three World Series titles the Giants would win over the following five seasons. The arrival of Sandoval and Posey gave the Giants something that had eluded the franchise for years: homegrown position players who developed into stars. While elite pitchers like Matt Cain and Tim Lincecum were bursting onto the scene, San Francisco trotted out lineups filled with imports and refugees — really, really old refugees — from other teams. In fact, before Sandoval and Posey, the last position player who had been drafted and developed by the Giants and then went on to produce better-than-average numbers for them was Bill Mueller, who hasn’t worn the orange and black since 2002. That was then. Brandon Belt, Joe Panik, Brandon Crawford, and Matt Duffy are now. Along with Posey, those four homegrown Giants have formed the best infield in baseball this year, per Wins Above Replacement. And while Posey was the can’t-miss player who didn’t miss, none of his colleagues ever quite garnered “elite prospect” status — yet all four have gone on to exceed expectations. With the team’s starting pitching not rating as the strength it used to be, San Francisco’s fantastic four has kept the defending champs in the thick of the playoff race and optimistic about the future. One of the most important tenets of roster-building is to downplay past results and make decisions based on expected future returns. Under Brian Sabean, Bobby Evans, and an experienced and shrewd baseball operations staff, the Giants have recently taken this lesson to heart. It’s a big reason why Sandoval — despite winning legions of fans with his postseason heroics and Panda-inspired personality — now plays for the Red Sox. This wasn’t something the Giants did all that well a few years ago, though. In the afterglow of the 2010 World Series, Sabean & Co. got swept up in a state of championship euphoria that clouded their judgment. One of the best players on that 2010 club was first baseman Aubrey Huff, who posted a .290/.385/.506 season that earned him his own seventh-place MVP finish. Huff was also a subpar defensive player who turned 34 at the end of that year and was just one season removed from a miserable 2009 campaign. Yet the Giants signed him to a two-year, $22 million extension anyway. Huff soon crashed back to earth in 2011,1 made 95 more plate appearances in 2012, and retired at the end of that season. Beyond its shortsightedness, the Huff signing kept a talented, young first baseman waiting in the wings for too long. Brandon Belt had absolutely destroyed minor league pitching during that same 2010 season, batting .352/.455/.620 across three levels. But the presence of Huff on the major league roster kept Belt either shackled to the bench or confined to the minors for most of 2011, triggering cries of #FreeBelt in the biggest seamhead corners of Twitter. Once given the chance to play more regularly in the big leagues in 2012, Belt thrived, posting numbers 19 percent better than league average, per wRC+. Despite the rise of the #Belted movement to honor each time he went deep, Belt derived most of his early-career value from feats other than home runs: In 2012, he hit just seven long balls in 472 plate appearances, but also parlayed a lofty 11.4 percent walk rate into a .360 on-base percentage. He’s walking slightly less often these days, but he’s made up for that by pounding extra-base hits: Although he plays in by far the worst home park in the majors for home runs, Belt’s .203 Isolated Power ranks fifth among National League first basemen over the past two seasons.2 Combine that pop with a still-strong .352 OBP and the third-best defense in the majors at his position,3 and the 27-year-old ranks among the best all-around first basemen in the league. 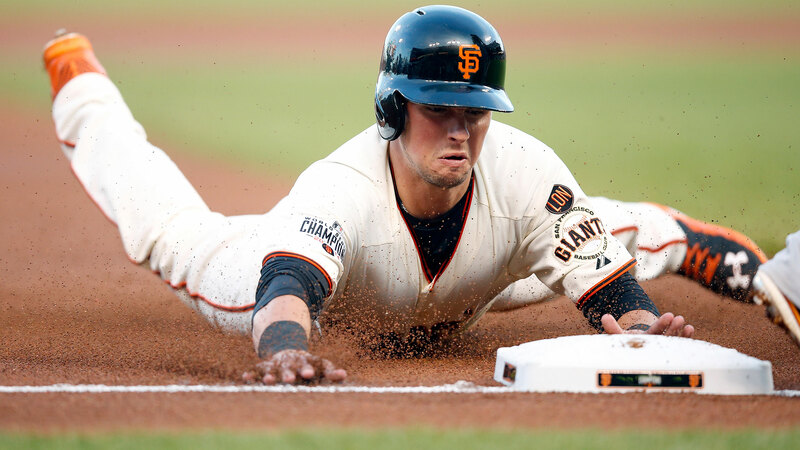 It’s not quite fair to call Joe Panik an odds-beating underdog. After all, the lefty second baseman was a first-round pick, the 29th overall selection in the 2011 draft. During his first season in pro ball, he batted .341/.401/.467 in short-season Single-A ball, walking more times than he struck out and flashing the kind of advanced hitting approach the Giants saw when they drafted him. From there, Panik’s numbers began to stall. He continued to show off that strong batting eye in 2012, but he didn’t compile the kind of gaudy numbers you’d want from a hitter in the mega-offense environment of the High-A California League. When a full season at Richmond of the Double-A Eastern League in 2013 netted a pedestrian .257/.333/.347 batting line, Panik was reduced to a bit of an afterthought among prospects. At no point in his minor league career did he ever earn even a top-100 ranking from the young-talent hounds at Baseball America, Baseball Prospectus, or MLB.com. Panik isn’t just an excellent player; he’s also a great fit for the Giants. As harsh as AT&T Park is on home run hitters, it’s a place that rewards contact hitters. For Panik, who owns the ninth-highest contact rate among MLB’s 162 batting-title-qualified hitters, that’s great news.5 He also sports baseball’s seventh-lowest swing-and-miss rate and is in the top third among NL hitters for line drive rate.6 At just 24 years old, five years away from free agency, and still making the league minimum, Panik has become one of baseball’s most valuable commodities. 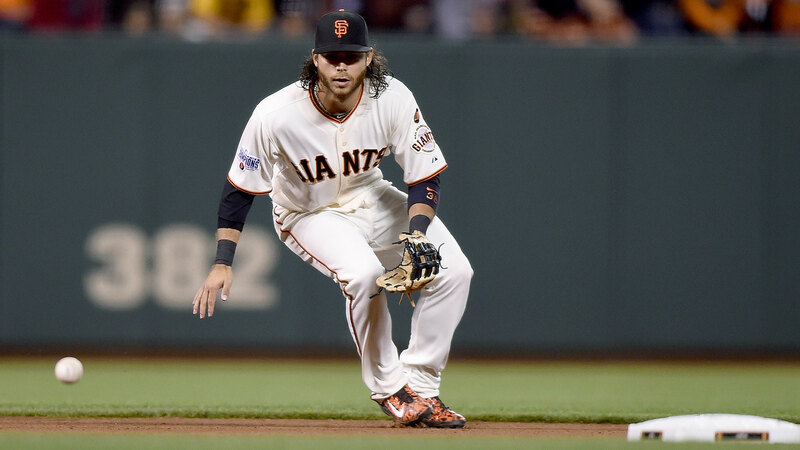 If Brandon Crawford didn’t do much more than play defense, the Giants would probably still be satisfied. 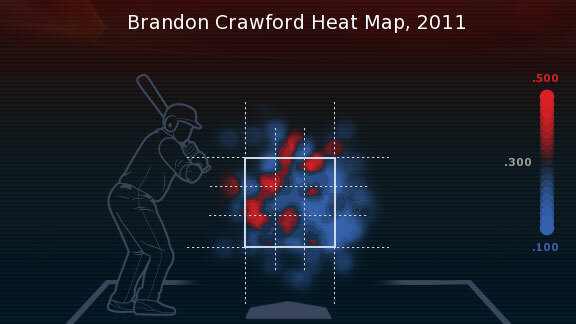 A fourth-round pick in 2008, Crawford’s calling card was always his glove. 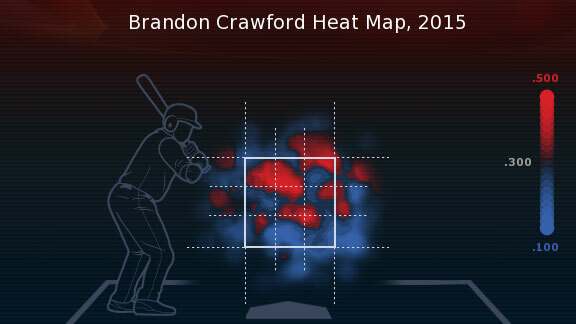 In 2012, the first full season of his major league career, Crawford saved 12 more runs than the average MLB shortstop, per BIS. Yet he was a nonfactor at the plate, batting just .248/.304/.349, which came on the heels of a .204 average and .296 slugging mark in his 66-game MLB debut the year before. That offensive progress, coupled with a glove that’s more impressive than ever,7 has made Crawford the best shortstop in baseball so far this season. And thanks to his lively bat and slick glove, he is about to get paid. As we’ve already touched on, the logic behind the Giants’ decision not to try to beat Boston’s $95 million offer for Sandoval was clear, and given Panda’s 2015 struggles, that move looks pretty shrewd now. Still, his departure left the Giants with a clear dilemma for this season: Who would play third base? At first, they tried Casey McGehee. The Giants got McGehee in a trade with the Marlins for virtually nothing because Miami had already acquired Martin Prado to play third, and that made McGehee expendable. It was worth a flier to pay the 32-year-old next to nothing to see if he could replicate a first half to 2014 that was so impressive he nearly made the All-Star team. (His season-ending .355 OBP wasn’t bad, either.) Unfortunately, that experiment didn’t work: McGehee hit just .213/.275/.299, the Giants cut him loose on July 8, and he’s now a Marlin again. Enter Duffy. The 24-year-old infielder brought the most modest pedigree of the infield bunch, coming to the Giants via an 18th-round draft pick. He put up playable numbers in the minors, hitting .304/.387/.413 in 248 games, but many of those at-bats came when Duffy was either a little old for a level or playing in a hitter’s park. Still, the Giants believed he could contribute at the big league level, and considering his ability to play second, third, and occasionally short, his ceiling seemed to be as a utility man. Given a chance to play every day at third, Duffy already looks like he might be something more. In 76 games, he’s hit an impressive .293/.335/.462, numbers that come in at a robust 27 percent above league average after adjusting for AT&T Park’s dimensions. For most multiposition players not named Ben Zobrist, there’s a jack-of-all-trades/master-of-none fear that these players won’t be able to carry their weight defensively if forced to consistently play one position. In Duffy’s case, those fears have been unwarranted: He’s a plus-four by DRS this year, making him a top-10 defensive third baseman over a relatively small sample size of 76 games. Now, Duffy still strikes out four times more than he walks, and we don’t have enough data to know if his high .338 batting average on balls in play is likely to hold firm as the season wears on. But since he’s a rookie and is making relative peanuts, Duffy has room to regress and still be a major asset for the defending champs. With Duffman guiding his bat, we won’t be the ones rooting against him. Currently 4.5 games back of the Dodgers in the NL West and two back of the Cubs for the second wild-card spot, the Giants still have some work to do if they want to make a run at a fourth title in six seasons.8 There are plenty of holes, and adding another front-line starting pitcher to complement Madison Bumgarner would be the dream scenario. Whatever happens this season, though, San Francisco figures to contend for years to come. Posey and Bumgarner are superstars. Hunter Pence is the middle-of-the-order threat who doubles as the emotional leader. 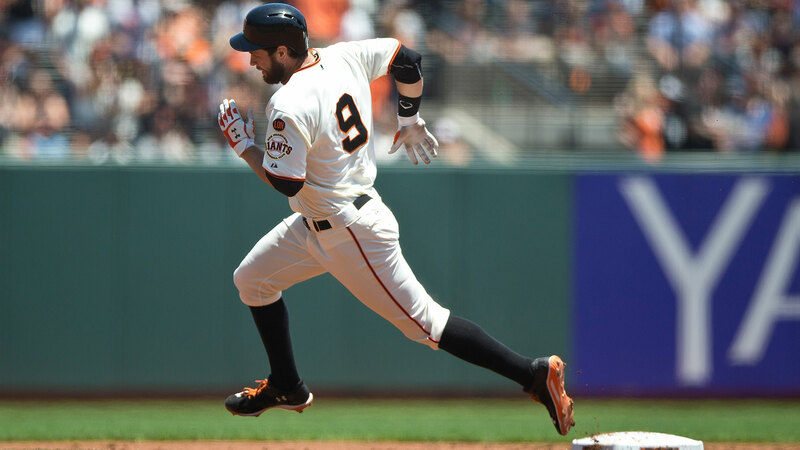 Surprise contributors like Aoki, Gregor Blanco, and Chris Heston have chipped in this year, and the front office has proved to be plenty adept at finding other sleepers. Moreover, you’ve got Bruce Bochy, one of the best skippers in the game and a future Hall of Famer. But the Giants wouldn’t be where they are now, nor would they have as bright a future, without the killer around-the-horn foursome that came out of nowhere. Minus-0.9 Wins Above Replacement, per FanGraphs. AT&T Park has suppressed Belt’s homer totals, but he’s tied for second in the NL with 24 doubles this season. He’s been the second-best player at his position this season, per Wins Above Replacement. Along these lines, San Francisco knows how to pick ’em. 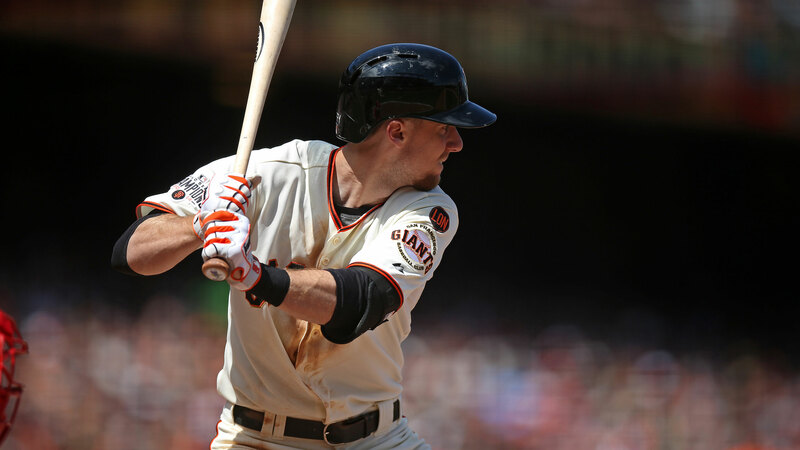 Four of MLB’s top 15 contact hitters are Giants: Panik, Posey, Nori Aoki, and Angel Pagan. No. 1? Belt. Like I said: The Giants can pick ’em. Crawford’s plus-10 Defensive Runs Saved ranks third in the majors among shortstops. FanGraphs gives them a 22.4 percent chance of making the postseason and a 1.1 percent chance of winning the World Series. The Future Looked Pretty Fun at the MLB All-Star Game, So Why Can’t We Have It Now?